Many classic and beloved Marvel characters were left out the basic game. Guys like, Silver Surfer, Dr. Strange, Thor, Nick Fury, Cable, Deadpool, and Hulk. 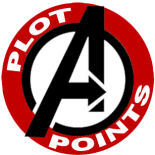 We have been slowly fixing that, and now it’s the time to debut the Green Goliath, here at Plot Points! I went on a different kind of approach when dealing with the Banner/Hulk duality, since the Sentry/Void solution didn’t seem fit to me. Essentially, I came up with two different datafiles, with specific conditions which switch them, and all tied together with a milestone. I think the Hulk will be a great choice of character for one-on-one adventures, but I also can see him working (and complicating) bigger pictures, like he did in the Avengers movie. Flip Data-file idea is nice. “Trying to control” seems more like an SFX than a Limit. Don’t think you need both milestones on both sides of the file (since one is clearly Banner and one is clearly Hulk). Almost forgot… Can allies assist somehow for “Trying to control” (either by rolling against Doom Pool themselves or with an Aid action (“Fight it, Bruce!”))? I can see you point in “trying to control”. But it is a Limit, since Banner don’t want to become the hulk, and to avoid that, he has to roll against the doom pool. It’s trick, because the Hulk is more than a curse than a blessing. About the same milestones on the both, i didn’t want to make a character with 4 milestones to track, but I still wanted to keep the simetry in the datafile. Kinda surprised Hulk doesn’t also have the Invulnerable SFX. I mean, yeah, it’d make it a bit overkill, but isn’t overkill what Hulk is all about? I think that the gamma healing was covering that. Anyone catch the Thor supplement posted on MWP? I was amazed by the work. Data File, villains and a mini scenario! 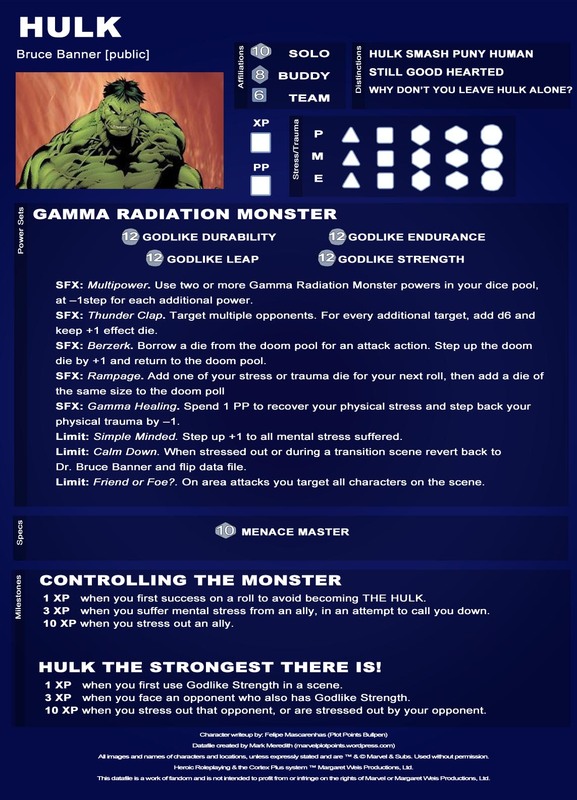 I love the idea of having a data sheet for both the Hulk and Doctor Banner. I think you did an excellent job of capturing the Hulk, without making him too overpowered. He will not connect with a punch all of the time, but when he does watch out! After looking at the stats for Thor and the Sentry, Hulk might be a little under-powered. I think adding Combat Expert, or Combat Rookie. might balance him out a little. When going toe to toe with Thor, who has 2 powersets and also a combat expert, Hulk may have a disadvantage. I didn’t think that hulk IS an expert combatant, he is just a savage fighter, that’s why i left it out. But to balace it i gve him a bunch of SFX (free of the Plot Point cost) to help him draw a bigger pool. First, let me say, you guys do great work. And I can can buy that early in his existence, Hulk may not have had Combat Expert, but I think fairly early on Hulk started doing some tricks that worked for his unique form of combat. Still really enjoyed the datafiles. Hulk is very tricky to handle. There is a number of ways to handle him. Mechanicaly-wise he may roll less dice than Thor, but, he has other ways to improve his dice pool and the constant healing is a huge factor. I’m dying to see the official approach that MWP is going to release in a couple of weeks. Oh, I totally get it, and honestly, Hulk has changed rather radically over the years as well. The Planet Hulk version, for example, definitely would have Combat Expert, and the “not connected to Banner” version should just be flat out more dangerous in general, because he doesn’t have any of the “stops” in place. Really digging the write ups, because on top of the actual datafiles being cool, it gets the brain working in the mind set of the system. 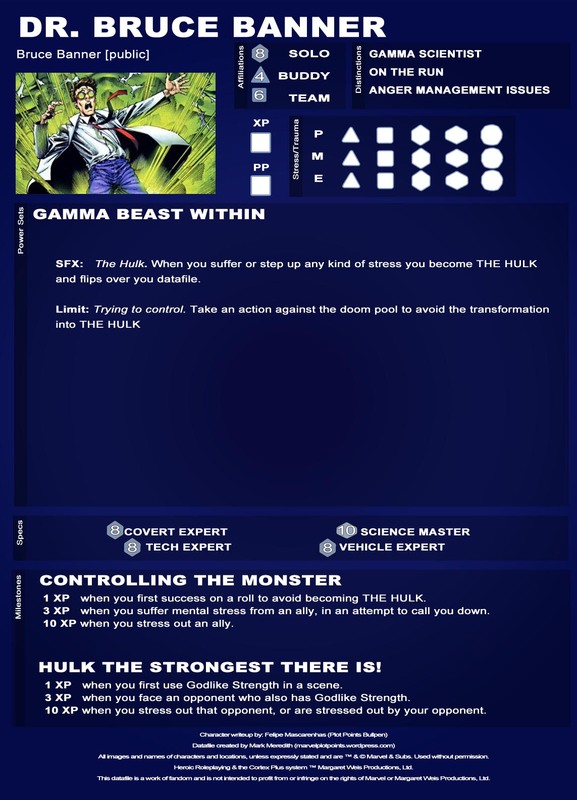 I totaly agree that during and after planet Hulk, he must have aquired AT LEAST combat expert. I went for a more “classical” and “timeless” Hulk, just the savage beast. I sure think that this hulk opens a lot of doors for tweaking. Shouldn’t there be a speed attribute to, considering he can run upwards of 300 mph i believe that’s a d8. Some versions of The Hulk don’t have (show) super-speed. But it makes sense. In the movies Ang Lee’s Hulk had super speed, but Wheldon’s probably not. This entry was posted on May 24, 2012 by felipenerdcore in Datafiles.